The counting of the votes will take place on December 11 along with four other states which went for polling recently. Over 2,274 candidates are fighting for 199 seats in Rajasthan. Chief Minister Vasundhara Raje from Bharatiya Janata Party, is looking to retain her position while the Congress is trying to oust the ruling party to form a government of its own in the state. 51,687 booths have been set up across the state. Out of the 259 are pink booths, exclusively for women. The Election Commission is expecting over 4.7 crore voters to turn up today. There are 2,49,61,569 male voters, 2,28,28,024 female voters and 222 people belonging to other genders. Violence has been reported from the district of Bikaner, Bharatpur, Dausa and Barmer. In Bikaner, a jeep taking voters to the polling booth was set on fire. In a clash between the supporters of two candidates at Deeg in Bharatpur., three people have been injured at Deeg in Bharatpur. The voter turnout was recorded at 59.7 per cent until 3 pm. The states voters polls was recorded as 6.11 per cent till 9 am, which was then recorded as 16 percent of voters until 11 am. Congress and Hanuman Beniwal's RLP workers clashed in Fatehpur, Sikar district, vehicles were set ablaze in the violence. Voting was halted for nearly 30 minutes due to the clash between the two groups. The cause of the confrontation remains unclear. According to the Election Commission's website, the voting percentage in Rajasthan was at 41.37 per cent till 1 pm. The polling began at 8 am in the state, there was a raising ruckus at some polling booths due to EVM malfunctions and people had to stand in long queues for many hours to cast their votes. Former minister of Sports and Congress leader Bhanwar Jitendra Singh casts his vote in Alwar. Jitendra Singh was also the former Defence minister of the state. He was born into the royal family of Alwar and holds the title as the 'Head of the Royal House of Alwar'. Incumbent Chief Minister Vasundhara Raje's Jhalarapatan constituency saw a turnout of 16 per cent till 11 am, which is lower than the state average of 22 per cent. Jhalarapatan constituency, which she has represented since 2003 is part of the Jhalwar district, which also includes Dag, an SC reserved seat, which saw 15.79 per cent turnout, Manohar Thana (14 per cent) and Khanpura (21.43 per cent). His Highness Maharaja Gaj Singh of Marwar and his wife Hemalata Rajye, former royals of Jodhpur, cast their votes in Sardarpura constituency at polling booth No. 194 in the Rajasthan assembly election. Election Commission of India spokesperson, Sheypali Sharan tweeted in her official account that 22 per cent of polling percentage has been recorded till 11 am in the state of Rajasthan. Rajasthan CM Vasundhara Raje tweets,"I did my bit. Did you?" Casting her vote on Friday morning, Rajasthan CM Vasundhara Raje tweeted, "I did my bit. Did you?" 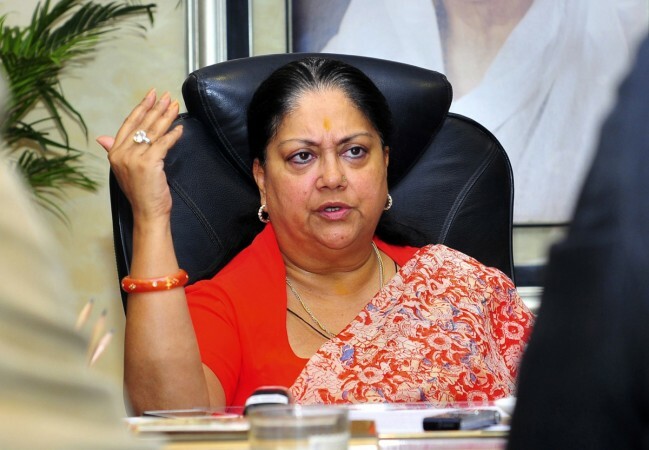 Raje is contesting in the Jhalrapatan constituency, which she has represented since 2003. She is standing against veteran BJP leader Jaswant Singh's son Manvendra Singh, who had left the BJP and switched to Congress just before the elections. Union Minister of State for Water Resources Arjun Ram Meghwal also stands in a queue for over an hour to cast his vote, after an EVM glitch at the polling booth number 172 in Bikaner. Former IT minister and Congress state chief Sachin Pilot cast his vote in Jaipur. "Put your vote today in the name of democracy. I urge the citizen to give your vote and select a government that can contribute to the advancement of the State and protect the interests of the people", he tweeted on his official handle. He has represented Ajmer and Dausa Lok Sabha constituencies in the past. The two-time Member of Parliament (MP) is seen as a chief ministerial possibility if the Congress wins. Rajasthan Chief Minister Vasundhara Raje said that she felt insulted over Sharad Yadav's remark, where he said 'Vasundhara (Raje) ko aaram do, thak gayi hain, bahut moti ho gayi hain'. To set an example for future it's important that EC takes cognisance of this kind of language. I actually feel insulted and I think even women are insulted, she said. An 80-year-old woman in Rajasthan cast her vote at booth number 103 in Sardarpura constituency of Jodhpur. Congress candidate from Udaipur, Girija Vyas cast her vote for the Rajasthan Assembly Election. She is contesting against BJP candidate Gulab Chand Kataria, the incumbent home minister in the Rajasthan government. Minister of State for Agriculture and Farmers Welfare and Jodhpur Member of Parliament (MP), Gajendra Singh Shekhawat casts vote for the Rajasthan Assembly polls. He was accompanied by his family. Rajasthan Chief Minister Vasundhara Raje casts her vote at polling booth number 31A in Jhalrapatan constituency of Jhalawar. Many Electronic Voting Machines (EVM) in Jalore have been reported of being defective, causing a delay in voting booths 253 and 254. Several cases of faulty EVM's have also been reported at Sawai Madhopur, Haidarshah, Chittorgarh, Pushkar, and Bengu. Electronic Voting Machine is being replaced at polling booth number 172 in Kisamidesar, Bikaner following a technical glitch. Former Chief Minister of Rajasthan and senior Congress leader Ashok Gehlot cast his vote at booth number 106 in Vardmam school Mahamandir, Jodhpur. He is contesting in the elections from Sardarpura constituency of Jodhpur. The election has been put off at Ramgarh constituency of Alwar district due to the death of Laxman Singh, the candidate of Bahujan Samaj Party (BSP). Singh died on November 29 due to a cardiac arrest. The elections are now taking place in 199 out of the total 200 assembly seats in Rajasthan.